Solar flaring activity was eruptive. There were several B-class flares and one C-class flare in the past 24 hours. Most activity occured from Active Region (AR) 2282 located in the Eastern hemisphere (E53). AR 2280 produced the largest flare, a C6.0 class flare on 2015-Feb-12 peaking at 02:12 UTC. Previously active NOAA AR 2277 has moved out of view over the Western hemisphere limb. NOAA ARs 2280, 2281 and 2282 all appear stable with small amounts of flux emergence. There is a large filament located between S45E10 and S10W70, however this has remained, and appears, stable. Flaring is expected to continue at the C-class level with a very small possibility of an M-class flare. No Earth directed CMEs have been observed.The solar wind speed has slightly decreased over the past 24 hours from 400 km /s to 300 km /s. The total magnetic field has been stable around 7 nT, and the Bz component has been largely positive, but has become more negative over the past 2 hours. The Bz has ranged between +7 and -6 nT over the past 24 hours. Geomagnetic conditions were quiet to moderate over the past 24 hours (NOAA Kp 0-2, local K Dourbes 0-3). A large transient coronal hole is currently located at the center of the solar disk, as this rotates into the Western hemisphere it is expected to produce enhanced solar wind speeds. Solar wind conditions have been quiet, which is expected to persist. With a possible enhancement over the next 24 hours if the CME/shock front produced at 23:24 UT on 2015-Feb-09 interacts with the Earth. 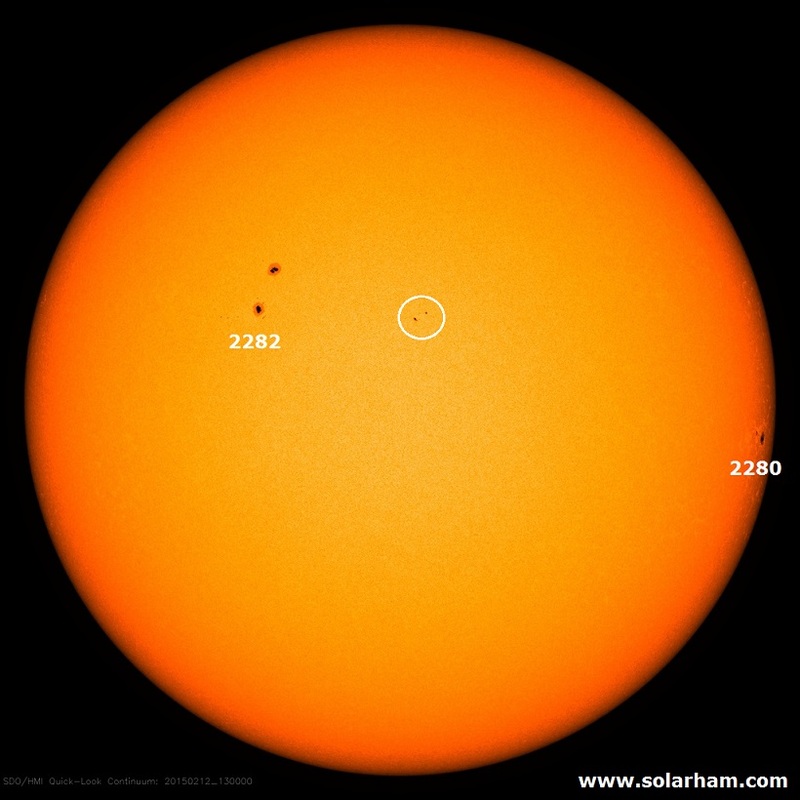 Geomagnetic conditions are expected to be quiet to unsettled with an isolated active period possible.